Why Did Steve Choose Walter Isaacson? I finished the Steve Jobs biography by Walter Isaacson quite some time ago, but I didn’t bother to blog a review because I didn’t think I had anything to contribute to the discussion that hadn’t already been more eloquently argued by others. But, when listening to John Gruber and Dan Benjamin discuss the book on the Talk Show podcast a few weeks back, they raised a question that piqued my interest, why did Steve choose Walter Isaacson to be his authorised biographer? You have to remember that this biography did not get written because the author was really interested in Steve Jobs and begged and pleaded for cooperation, if anything, the inverse is true. In the introduction to the biography Isaacson explains that it was Steve who asked him to do the book, and that he repeatedly turned Steve down before finally giving in (to the inevitable?). Isaacson specifically mentions that Steve had cited his love of his biography of Albert Einstein as one of his reasons for wanting him as his biographer, so I figured I’d give that a read too, and see if it helped me to understand Steve’s decision to head-hunt Isaacson. Apple have asked Mac fans to share their thoughts on today’s passing of Steve Jobs with them via rememberingsteve@apple.com. I’ve just sent off the email below – please consider taking some time out of your day today to share your thoughts too. As one of the very many relatively recent Apple converts, I’d always hoped there’d be many more keynotes to come, and many more revolutions for Steve to introduce us all to. I wasn’t there for the unveiling of the Mac in 1984, or the iMac on Steve’s return to Apple, or OS X, or even the iPod, but I did get to enjoy the keynotes that introduced the world to the iPhone, the iPad, and iCloud. I think it’s safe to say that the first two of those have already revolutionised our interaction with the world, and I lets hope iCloud goes on to do the same. I’m tempted to dwell on thoughts of all the great things Steve could have shared with the world had he been as immortal as we all wished, but I think that’s the wrong way to look at things. Steve planted a seed, watered it, and cared for it for years. That seed has developed into a strong and vibrant young tree, which is mature and strong enough stand alone now. It’s a tree that will bear many more great fruits, and each of those fruits will be infused with Steve’s passion and vision. I don’t think it’s possible to extract Steve’s values or aspirations from Apple any more, so in my mind, a part of him has found immortality. 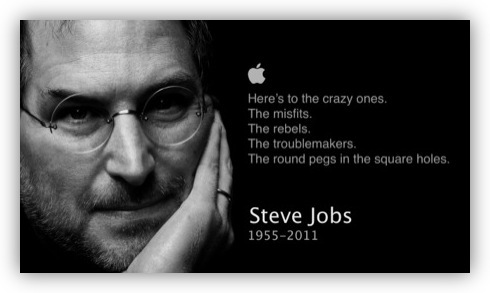 A strong, vibrant, and innovative Apple will serve as the best possible memorial to Steve. I hope his family and friends will be able to take some comfort from watching his legacy grow, mature, and blossom. Here’s hoping that Steve’s legacy through Apple, Pixar, and his family, will stand as a beacon through time for much longer than the 56 short years of his life. Imagine a world where every online store sells DRM-free music encoded in open licensable formats. In such a world, any player can play music purchased from any store, and any store can sell music which is playable on all players. This is clearly the best alternative for consumers, and Apple would embrace it in a heartbeat.